Networking is CRITICAL in today’s business world. Your business can’t survive without it! Tim Houston, the global authority on strategic business networking, teaches how to systematize your networking efforts to be more productive, profitable and prosperous. Tim knows that your audience wants to learn new ways to network in less time and with less struggle. They want to know how can they create more opportunities for themselves and others, and with better results. 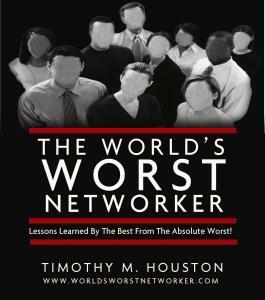 The author of the Amazon Top 3 and internationally acclaimed bestseller, The World’s Worst Networker: Lessons Learned By The Best From The Absolute Worst! has the answers. Go beyond the networking basics to produce higher quality contacts and more profitable referrals. Learn the definitive ways of how not to network. Increase your sales by strategicly positioning yourself as a resource, both online and offline. Create long-lasting, synergistic, prosperous relationships with people in different professions, across different generations. Why have Tim Houston present at your next conference, convention, meeting or event? down-to-earth, entertaining personality, will make your event memorable and enjoyable. Many people believe that networking is an easy task. So why do some people end up with very poor results? In a very interactive, engaging and entertaining presentation, Tim shares the true stories about the most outrageous flubs, faux-pas and fiascoes that he and some of the world’s leading networkers have experienced and observed. Whether your audience is new to networking or are experienced veterans, they will come away learning the definitive ways of how not to network. SET YOUR NETWORKING ON FIRE WITH I.C.E. Do you cringe when you hear the word “networking”? Do you find reasons to avoid going to in-person networking events? Maybe you think you’re not a great networker or that it’s only for “salespeople”. In this engaging, interactive presentation, bestselling author and Business Networking Authority, Tm Houston will teach us how to set our internal and external networking on fire, using a simple tool called I.C.E. Learn how great networkers go beyond just “working the room”; Find out who are the “Golden Geese” on your team and in your network; Learn the 10 Commandments of Networking. These simple techniques and more will help you to avoid becoming one of The World’s Worst Networkers and will make your networking more productive, profitable and prosperous. network with members of each generation in order to build stronger cross-generational relationships, more valuable contacts and profitable referrals. Most people start out with a low level of training on how to network. Over time and through trial and error, they develop the skills necessary to move themselves and their businesses ahead. For some, it takes a long time while for others it comes with ease. The secret is to learn, acquire and then master the networking skills needed while at the same time, leverage your time to acheive greater results and rewards. will result in an explosive growth of contacts and profits. Learn how Tim used to these to transform one of his companies to do business 100% by referral only. “come alive” before any audience and put your audience “under a spell” to move, motivate and inspire then into action. Tim reveals these and more powerful, proven tools and techniques so your presentations will be filled with emotional and intellectual sizzle!